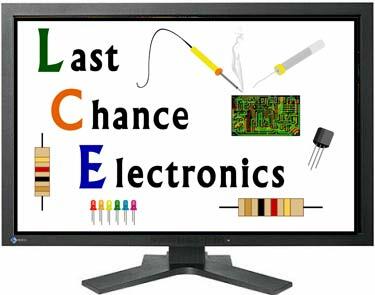 When your LCD monitor or TV goes out, call us at Last Chance Electronics. 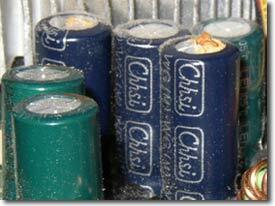 Often times, the problem can be tracked down to a simple capacitor failure or other minor repair. In fact, there have been multiple bad batches of capacitors manufactured in recent years causing many different electronic parts to fail. which will fail eventually. 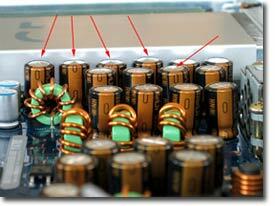 A dirty dusty cooling fan and Heat combine will also cause capacitors to be defective. Sometimes you can actually hear them pop! Bring your problem LCD monitor to us today and get it fixed! Note the bulging capacitor tops... 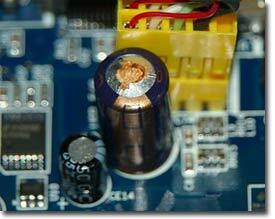 This can cause intermittent problems with your LCD monitor, or can cause it to fail completely. Two of these capacitors are leaking, which will definitely cause problems for you and can be easily replaced by Last Chance Electronics.